It was an afternoon that turned out to be a double bonus. One got to catch up with designer Vidhi Singhania whose saris are deep rooted in the Indian textile traditions and are eternally beautiful. I have saris that I have picked up from her years ago and they are still stunning and look contemporary which I guess is the hallmark of a true classic. Once again her summer collection was seductive with beautiful colours that were so inviting for summer wear. The afternoon also gave me an opportunity to be introduced to some amazing jewellery by Jaipur jeweller Sunita Sekhawat whose Rajasthan Royalty inspired jewellery uses artistry and traditional techniques and draws upon kundan meena jadauand polki to create her signature pieces. One used the oppurtunity to find out a little more about this talented jewellery designer by engaging her in a tete a tete. An intuitive association between two houses of design that are devoted to rarefied artforms Sunita Shekhawat and Vidhi Singhania came together to usher in spring-summer with an ode to the season with fresh renditions of hand woven textiles of Kota and Kundan- meenakari jewellery. On the afternoon of Friday, April 7th, the acclaimed designers celebrated their love for homeland, Rajasthan using their mediums as a canvas and illustrate with a vibrant colour palette, which this season is inspired by bright and pastel tones of foliage and Basant. The source of inspiration for Sunita Shekawat, the well acclaimed designer hailing from Royal Rajput family has been her homeland, Rajasthan and the cultural contrasts between other regions. For 25 years it is this mood board that she draws from and presents a palette of unusual hues and tones in new forms. A core theme through all collections is duality. On either side of the jewellery one will find two styles of illustration, one traditional and the other modern. The season and inspiration behind this latest collection is Basant in all its flora, fauna and association with the Peacock. Each piece of jewellery represents a unique journey, every craftsman adds a personal touch and perfection to the piece, guided by Sunita Shekhawat’s devotion and attention. For over the past two decades, classicism, has been the cornerstone of Vidhi’s design sensibility, and her eternal love for Rajasthan which she moved to in 1994. Sajda, an opulent theme inspired by the aesthetics of Raja Ravi Verma; the Mughal jaals, the palace marble baradari and carvings; the bandhanwar, the auspicious door hanging, the chattars in ancient temples, and the kalasha harping on the prominence of the water bearer,all become an ethereal weaves. Adding intricacy and value to her weaves with the stunning Gota pattis, lehariyas, and the immaculate batiks, block printing and embroideries, that are instinctively alluring, Vidhi’s collection brings to the table a perfect blend of traditional, contemporary and cosmopolitan flavor. Vidhi and Sunita, both creative visionaries believe in the elegance of handcraftsmanship and they have both been recognized globally and nationally ​as upholders of​ the legacy of their respective crafts, namely meenakari for Sunita Shekhawat and the narratives of Kota weaves for Vidhi Singhania. Not only have they preserved these crafts but have also evolved their repertoires. Patrons and guests who came to view the collections and indulge in detail therapy included : ​Vani Tripathi, ​Monica Jajoo, HH Rajshree​ Kumari Bikaner, Anju Ralhan, Charu Munjal, Madhu Verma, Pooja Chauhan, Karuna Shriram, Ashwini P. Bahadur, Meenakshi Singhania, Actress Monica Kohli, K Shriram, Bani G Anand. Both the hosts looked resplendent indeed dressed in the beautiful kota saris from Vidhi’s collection and the meenakari jewelery by Sunita Shekhawat. Joining Sunita in welcoming the guests to her atelier was her daughter creative director Niharika Shekhwat alongwith Vidhi’s daughter in law Sana Singhania. .
Art and craft connoisseurs, mingled over high tea and shared their admiration for these distinctive and powerful houses of design, that were the original revivalists. 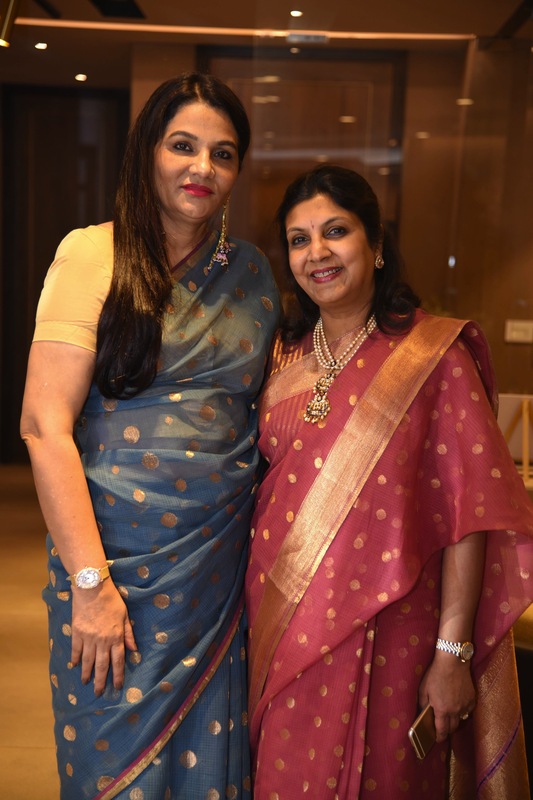 Known as upholders of legacy of Kotah and of Mughal Kundan-meena, both Vidhi Singhania and Sunita Shekhawat paved the way for the reclamation and re-imagining of their respective handicrafts for over 20 years. Both designers use their mediums as a canvas and illustrate with a vibrant colour palette, which this season is inspired by bright and pastel tones of foliage and ‘basant’. Vidhi’s creations are renowned for the intricate karigari that goes into transforming the weave into a piece of art with a dexterous detailing meticulous hand embroidery and hand painting. Sunita’s pieces are recognized for their minimal aesthetic that breaks through with a unique illustrative quality that is a heady balance of shape, proportion and motif. Next Sun shone bright in Gurgaon!